The Graves-Chapple Research Center provides research-based information to area producers under local conditions. Whether it is flood, drought, insect pressure, resistant weeds or new technologies, the goal of the site is to try and demonstrate products and techniques to increase profitability for producers in the region. When the Graves-Chapple Research Center first opened its doors in 1988, the goal of the site was to demonstrate the viability of no-till farming practices in northwest Missouri. To help express their confidence in the system, all trials and demonstrations at Graves-Chapple were conducted using no-till, a practice that continues to this day. 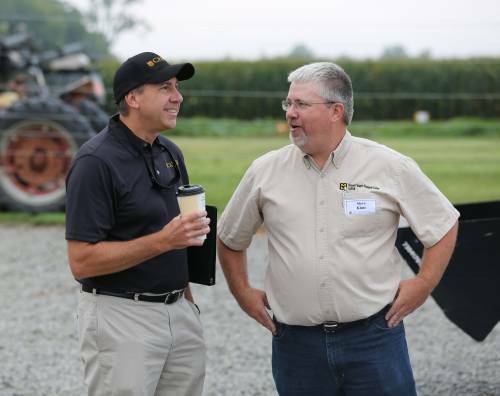 Steve Klute (right) has been involved with the Graves-Chapple Research Center since the mid-90s, joining the Center’s advisory board during that time. The Center provides research-based information to area producers under local conditions. Whether it is flood, drought, insect pressure, resistant weeds or new technologies, the goal of the site is to try and demonstrate products and techniques to increase profitability for producers in the region. Local producer Steve Klute has seen that work firsthand. Klute’s family has been farming in Atchison County since the 1920s. He has continued the tradition, farming with his father and son. Klute has been involved with the Graves-Chapple Research Center since the mid-90s, joining the Center’s advisory board during that time. Klute has served as the chairman of the advisory board since the late 90s. He is highly involved in helping Graves-Chapple connect with its local producers – and making sure the Center is conducting research pertinent to those farmers. Klute’s ties to the University of Missouri go back to high school. Klute helped MU as a crop scout, spending plenty of time in local fields helping farmers make good management decisions. “I’ve put a lot of miles into the fields of northwest Missouri,” Klute said. Klute’s farming operation is predominantly row crop. His entire acreage is no-till. The idea for the Graves-Chapple Research Center all started with a letter, written in the late … Expand ▸The idea for the Graves-Chapple Research Center all started with a letter, written in the late 1980s, by a handful of agriculture agents located in northwest Missouri. 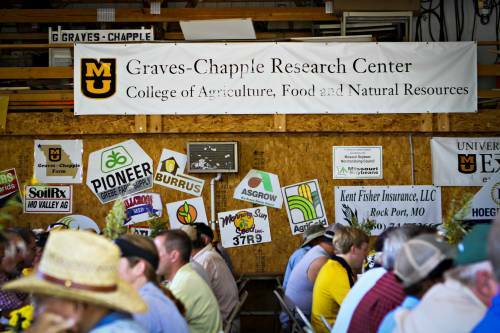 The idea for the Graves-Chapple Research Center all started with a letter, written in the late 1980s, by a handful of agriculture agents located in northwest Missouri. The letter was addressed to then-CAFNR Dean Roger Mitchell and written by Wayne Flanary, agronomy specialist; Bob Chapple, ag engineer; Mike Killingsworth, farm management specialist; and Don Mobley, livestock specialist. The focus of the letter was on the need for a research demonstration site in that corner of the state. Mitchell was in complete support of the idea. Mitchell gave the group $10,000 in seed money to begin operations. 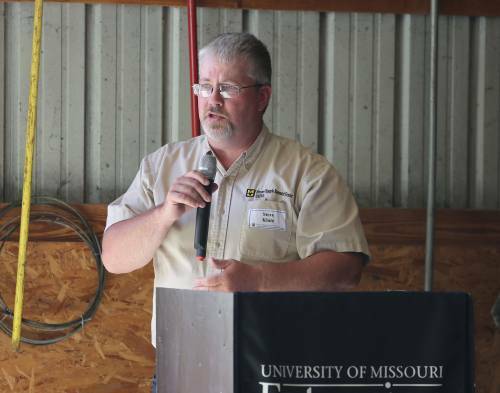 Rex Ricketts, who served as a coordinator of the MU Extension Commercial Agriculture Program for a number of years, also contributed to make the site a reality. Chapple’s good friend, Donald Graves, had some acres along I-29 between Corning and Rock Port in Atchison County that would work well for a research and demonstration site. Graves lent the group a tractor and other equipment and things were off and running. The Graves Farm was officially unveiled in 1988. “We worked out of our pickups that first year,” Flanary said. “There were no buildings or facilities. It was just land. Klute has served as the chairman of the advisory board since the late 90s. He is highly involved in … Expand ▸Klute has served as the chairman of the advisory board since the late 90s. He is highly involved in helping Graves-Chapple connect with its local producers – and making sure the Center is conducting research pertinent to those farmers. The friendship between Graves and Chapple was a key part of the development of the Graves-Chapple Research Center. Donald Graves passed away in 1989. Bob Chapple passed in 2013. Their devotion to agriculture made the Graves-Chapple Research Center a reality. Crawford and Flanary continue to bring useful research to the producers in the area. Both individuals have MU Extension appointments as well, tying them even closer to the local producers in their community. Klute has not only taken the Graves-Chapple Research Center research to heart, he helps during the annual field day, the annual FFA day and the numerous other educational events that the Center hosts.